Thank you for taking the time to browse through our bridal website. We pride ourselves on our range of wedding dresses, bridesmaids dresses and any wedding accessories you could ever wish for. We have beautiful unique creations from sought after designers such as Pronovias, Novia D'art, Justin Alexander, Fara Sposa, Patrizia Ferrera and Maria Karin. Working with such renowned wedding gown designers, Bijou ensures our brides have excellence in design, beautiful fabrics and perfect fit. Bijou Brides are up to date, unique and have the 'WOW!!!' factor on their special day. At Bijou we will experiment with various wedding dress shapes, designs and materials. 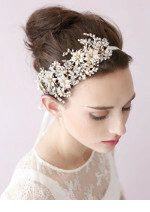 It will become apparent what suits you, as you become more confident looking and feeling amazing in your wedding dress. We will advise, guide and listen to all your thoughts and ideas. Your individual requirements can be met by adding straps for example. It is your dress and your day and quite simply has to be perfect! Located in the picturesque seaside town of Tramore, Co. Waterford, Bijou Bridal is only 10mins from Waterford City, 40mins from Kilkenny, within an hour of Wexford and Carlow and just over 1.5 hours from Cork and Dublin. Tramore, With quaint cafes and beautiful boutiques will always be an enjoyable destination so why not make a girlie day of it!